IN GENERAL, the start to the season has gone well for Bristol Rovers. The results results have been mixed, but the performances have been pretty good so far. In the first home game they disappointed but then they went on a run for the next three games in the league. There were good performances and late goals at Yeovil and Luton. But the team has deserved the wins which they have picked up. They had lost three on the bounce going into the Plymouth game last weekend. They can count themselves unlucky to have been one that run, but did not play well in one of the games - against Accrington. Having said that, Accrington deserve credit for how they played. So, it was important for them to avoid defeat at Home Park against Plymouth last weekend. No one ever said that was the case, but there was a feeling a point was what was wanted. They got that with a last-minute goal - their third of the season. 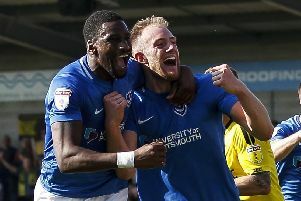 So, all told, that has made it a good start on the team’s return to League Two. The expectation from people is this team should be above this division. But people are coming around to the restrictions manager Darrell Clarke has. His budget is probably a third of what Portsmouth have to work with. So people are now being more realistic about expectations and where the team should be going. Clarke is a pretty popular figure with the supporters. He’s the most successful manager Rovers have had in the last six or seven years. They did have that blip when they were relegated the season before last. But Clarke was there for about eight games at the end, so it’s hard to pin the blame on him. He did very well to get the team back up again last season, too. He’s been quite measured in his recruitment this summer give the restricted budget. The players he has brought in have settled, on the whole, pretty well. Jeffrey Monakana and Billy Bodin have not had a huge amount of game time, though. Clarke tried a wing-back system but didn’t work and has changed it. On the whole it’s been the players who have succeeded previously who have stood out again so far. Chris Lines, Ellis Harrison, Matt Taylor, Scott Sinclair and Tom Lockyer have been the pick, while Daniel Leadbitter was doing well before he got injured.